It's hard out there for a voice actor. It doesn't matter if you're Nolan North, Jennifer Hale or Steve Blum, it seems that some companies are always going to look for big name "Hollywood" talent first. This has been a thorn in the side of one particularly iconic voice actor - Jon St. John. 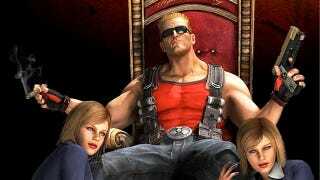 You probably know him as the voice of Duke Nukem, but he's a veteran voice actor and radio personality with over 30 years of experience in the industry. I recently stumbled across a video he'd made in which he blames Hollywood celebrities for the lack of work being given to legitimate voice actors these days. "Film actors do not need voice acting roles in video games, or commercial projects. These roles are for voice actors not Hollywood celebrities, and when you consider the amount of money they make for each and every film project, it is unfair to those of us who struggle to make ends meet in our chosen profession. I have trained and worked hard for nearly 30 years as a voice actor, and when a film star lands a role in either a game or commercial project they earn far more than I do, even though I am also SAG-AFTRA union member. How is that fair? I don't appreciate them taking work from me and my fellow VA's." Jon didn't comment when I asked him what he thought about companies who believed they could use celebrities like Liam Neeson and Patrick Stewart (who are both talented actors with recognizeable voices) to add value to their games - but I've no reason to believe he feels any differently. To Jon, film actors are film actors and voice actors are voice actors and Hollywood needs to stay away from his bread and butter. What say you? Do you agree with Jon that film actors have no place doing voice work? Or do you think that a talented film actor should be allowed to lend his or her voice to games as well?